The Chinese government is promising to clamp down on inflation as it raises incomes and spending on low-income housing, spreading the benefits of economic growth. China's government promised Saturday to clamp down on inflation and urgently raise incomes as it pushes to spread the benefits of economic growth at a time when living standards are rising but so are popular calls for greater change. In a more than two-hour speech that is China's equivalent to a state-of-the-nation address, Premier Wen Jiabao vowed to boost assistance to working class, rural Chinese and pensioners, build more affordable housing, exempt lower-income citizens from taxes and raise spending on education and health insurance. Along with increased social spending, Wen said pulling down inflation and closing the wide rich-poor gap were top priorities. He directly linked their urgent resolution to the need to keep people happy and stave off unrest while the government slows the breakneck growth of recent years to a more sustainable level. "We must make improving the people's lives a pivot linking reform, development and stability ... and make sure people are content with their lives and jobs, society is tranquil and orderly and the country enjoys long-term peace and stability," Wen told the 2,923 delegates gathered in the Great Hall of the People for the opening of the national legislature's annual session. Security, always suffocating during the congress, is absolutely smothering this year following calls of unknown origin posted on the internet for Chinese to imitate the popular protests that unseated autocrats in Tunisia and Egypt. A new appeal called for more protests Sunday, the third in a row, though the previous two have attracted onlookers, journalists and swarms of police, but few outright demonstrators. Outside the hall on nearby Tiananmen Square, police led away at least eight people, likely among the many petitioners from all over China who try to sneak past security cordons to come to Beijing during the 10-day National People's Congress to seek help with grievances. 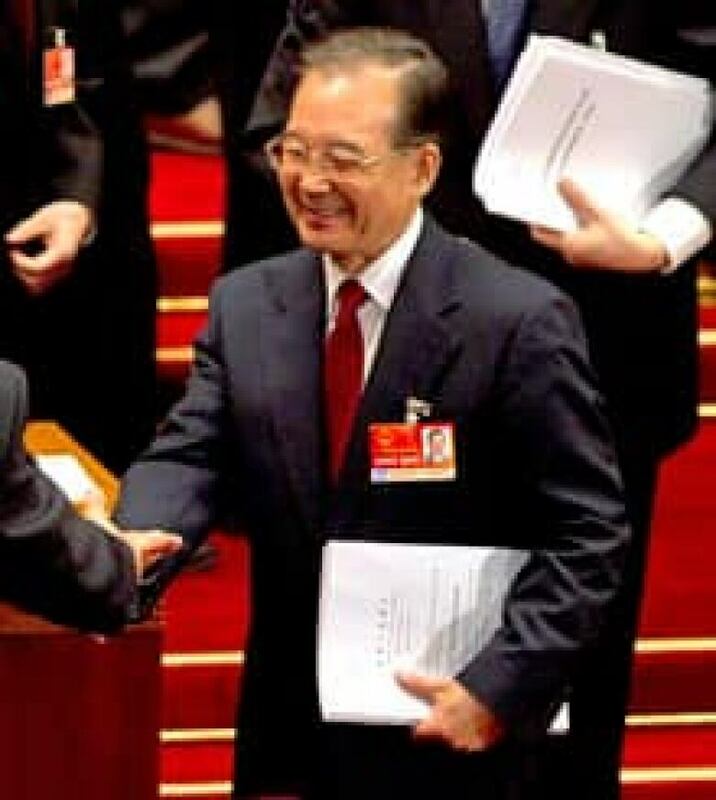 Though he pronounced himself pleased with China's impressive development of recent years — he cited the 9 per cent growth in incomes in rural and urban areas in the past five years — Wen also listed significant pitfalls: growth that benefits the cities and industries over farmers and services, environmental degradation, and excessive investment causing asset bubbles, especially in housing. Chief among the problems Wen targeted was inflation, which has hovered around 5 per cent in recent months and especially affects poorer Chinese who spend larger parts of their incomes on food. "This problem concerns the people's well-being, bears on overall interests and affects social stability," Wen said. He said the government would continue to impose price controls as needed, raise price supports for wheat and rice, and increase the supply of key commodities by building up reserves to be released into the market when needed. The centerpiece of Wen's program — certain to be approved by the Communist Party-controlled congress — is a five-year plan that outlines an ambitious transformation: moving the economy from its dependence on state investment and exports to one driven by consumption. If accomplished, the change would boost household spending power through higher wages, level the playing field for private companies and end policies that have effectively shortchanged consumers and channeled savings to the favoured state-owned enterprises. The move would also likely reduce friction with the United States and other trading partners as China imports more to, Wen said, "correct trade imbalances." Getting there, however, would require altering the successful formula that has helped propel China to the world's No. 2 economy. It would also challenge deep-seated interests — from state companies and real estate barons who have benefited from cheap bank loans to politicians whose careers have benefited from the resulting high rates of growth. Just when it needs cohesion, the leadership is also in the midst of an always contentious transition. Wen, President Hu Jintao and most other members of the Politburo Standing Committee are expected to begin stepping aside late next year for a new generation of technocrats. In a sign of friction, Wen's program sets a normal target of about 8 per cent economic growth this year, falling to 7 per cent annually for the 2011-15 period, hoping to downshift to better quality growth. But most provincial and other local governments have set higher rates, some in double digits. Perhaps the biggest challenge for Beijing is empowering consumers without encouraging them to demand greater political rights. Protests have proliferated in pace with affluence over the past decade. Chinese scholars, extrapolating from state media reports, estimate that large-scale demonstrations, strikes and other mass disturbances reached 180,000 last year — a doubling in five years. Wen twice mentioned the unauthorized confiscation of farm land and illegal demolition of houses. He also pledged a more vigorous fight against corruption, especially making senior officials report theirs and their families' incomes and stop selling off land for development. All are common causes of protests as local governments try to boost growth through construction. Closing the income gap, however, is at the heart of the leadership's efforts to calm a restive public that demands greater government accountability, if not political change. "This is both a long-term task and an urgent issue we need to address now," Wen said. "Through unremitting efforts, we will reverse the trend of a widening income gap as soon as possible and ensure that the people share more in the fruits of reform and development." Overall government spending will rise 12.5 per cent to $823 billion this year, a notch above last year's rate. Out of that, Wen said funds for building low-income housing will rise 30 per cent, to $15 billion. The government, he said, would also steadily raise the minimum wage, though he did not say by how much. Wen, however, also struck an uncompromising line on dealing with unrest, suggesting that the security forces would continue to receive the hefty budget outlays of recent years. A task force from elite Tsinghua University reported last year that spending on internal security nationwide was on par with the official defence budget and was expanding much faster. While the domestic security budget is unpublished, official military spending received a 12.7 per cent boost this year, to $91.5 billion. Some members of the task force have questioned that smothering security — evidenced in recent weeks in Beijing in response to calls for a Middle East-style "Jasmine Revolution" — saying the costs are burdensome and it risks alienating the public and stifling appropriate demands for change.